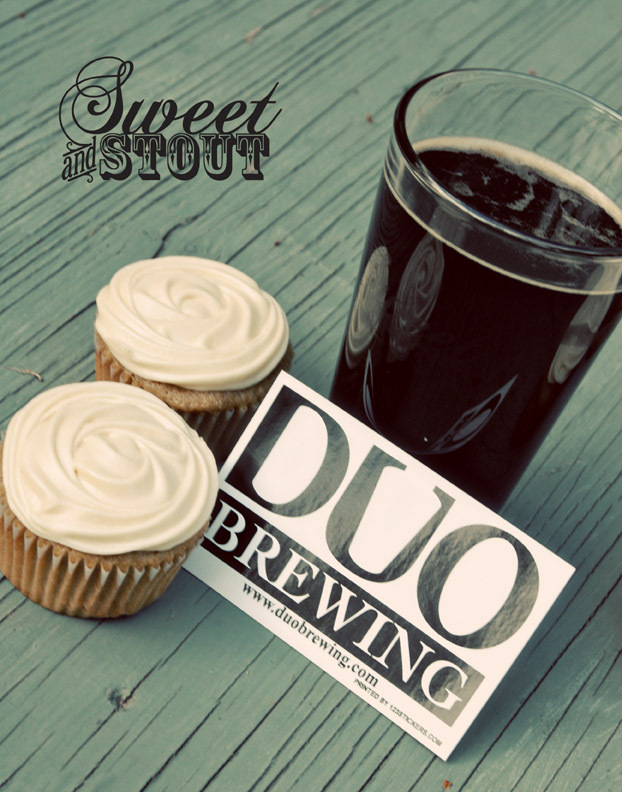 Sweet and Stout Where beer and cupcakes unite! If you follow us along on Facebook, you may recall the time that I mentioned that Dylan and I met Dan O’leary, the owner of Duo Brewing. We met up with Dan a while ago and brought him some cupcakes and being that Dan is awesome, a few weeks later he sent us a few bottles of his Twin Ports Porter. Dylan and I shared a bottle that same night (I was really looking forward to trying it, we love getting beer in the mail!) and really enjoyed it. The porter has a nice roasty quality to it and is very easy to drink. I was really looking forward to using it in a cupcake and wanted to create the perfect recipe to match it. We steered clear of the chocolate and opted for a buttermilk cake that really let the beer flavor shine through. For the frosting we made dulce de leche, which if you’re unfamiliar, is the most delicious thing you could put on cupcakes, ever. It’s made from cooking condensed milk, the sugar gets all dark and delicious and almost tastes like caramel, except it’s much, much creamier. If you’re on Pinterest you may have seen a pin for taking a can of sweetened condensed milk and either putting it in a crock pot for hours, or cooking it in the can on the stove (covered in water). We went with the shorter version and simmered the unopened can in water for 2 hours, then let it cool before adding it to our cream cheese frosting. Best. Idea. Ever. When I opened the can, I was pleased to see that it had worked, and I was equally as pleased that it was frickin’ delicious. The cake turned out so soft, which was a great compliment to the smooth and soft texture of this frosting. The whole cupcake tastes like a deliciously creamy porter, and it’s really hard to resist the 2 dozen of them that are still in our refrigerator. We decided to bake these on Saturday because we’ll be busy baking some fresh cupcakes for the Manito Tap House AND a new location that we will be announcing shortly! We’re pretty excited about it, and we’re looking forward to sharing it with you all! Does this make your thirsty? This weekend did not feel like June, at all. Saturday we were lucky to get into the high 40s, and it was pouring rain most of the day! Sunday has brought a bit of sun so far, but I could really go for 80 degrees right about now. This week’s cupcake is inspired by the weather I wish we were having here in the Pacific Northwest! Peaches and cream is a classic flavor combination for a reason, it’s amazingly delicious. 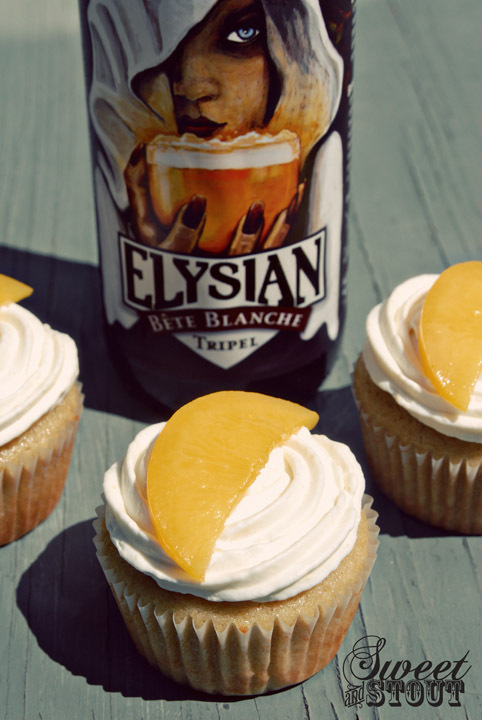 As always, there’s a Sweet and Stout twist to these cupcakes, I baked the peach cake with Elysian Brewing Company’s Bête Blanche Tripel. I wasn’t quite sure what beer would go with a peach cake, but after perusing the beer section I decided a tripel would be a good choice. Tripel’s have that classic Belgian spicy-fruity taste to them, and this beer went really well with the peaches. It’s incredibly easy to drink, too. The cake had about a cup of pureed peaches in it, and yet only came out with a slight hint of peach flavor. Next time I will dice up some peaches and put them right in the batter. It did bake up nice and soft though, very tasty. For the frosting I used a whipped cream and cream cheese frosting and, oh my, it’s bowl-devouring good. There is quite a bit of leftover frosting, and I’m imagining myself with a giant plate of peach pancakes later topped with a lot of frosting. Whipped cream is the shiz. For real. To make sure there was no mistaking these cupcakes for anything but peach, I garnished each with a thin slice of it’s fruity namesake. It’s hard not to shove the entire cupcake in your mouth due to it’s delicious nature, but I’m refraining from eating them all. For now. As I mentioned last week, Dylan and I participated in the Spokane Humane Society’s Parade of Paws. We got a bit soaked, but it was totally worth it. Our dog went into puppy and puddle overload, and had a great time. Our team, A Furry Frenzy, raised over $700 for SHS, and we’re proud to have been a part of that. For your enjoyment, here’s a picture of our dog, Big, soaked after the event. 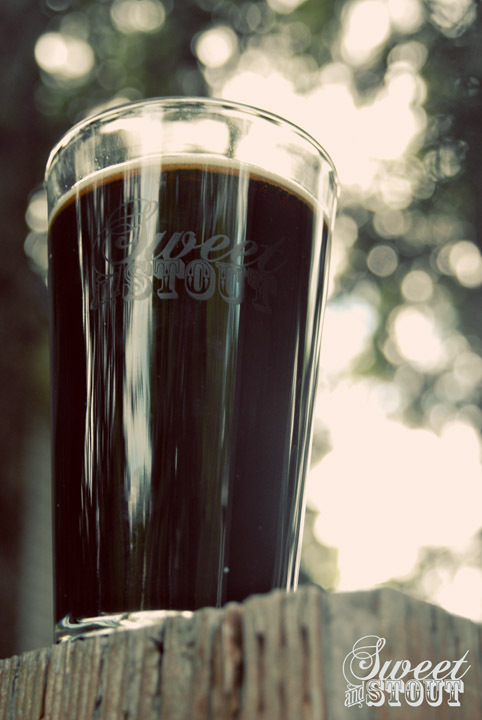 It’s been quite the whirlwind of a weekend for us here at Sweet and Stout! With our wedding rapidly approaching, we’ve been getting pretty busy taking care of all the fun little details that go along with planning such an event. We were also plenty busy this weekend doing cupcake and beer related activities! On Friday evening we made a guest appearance at Spokane Real Deals and their Girls Night Out event. We sold some cupcakes, and got to talk with some really great people, including Rachelle and Kris, the owners. We also met Ginger of Peace, Love & Pearls, who does great work revamping vintage jewelry. 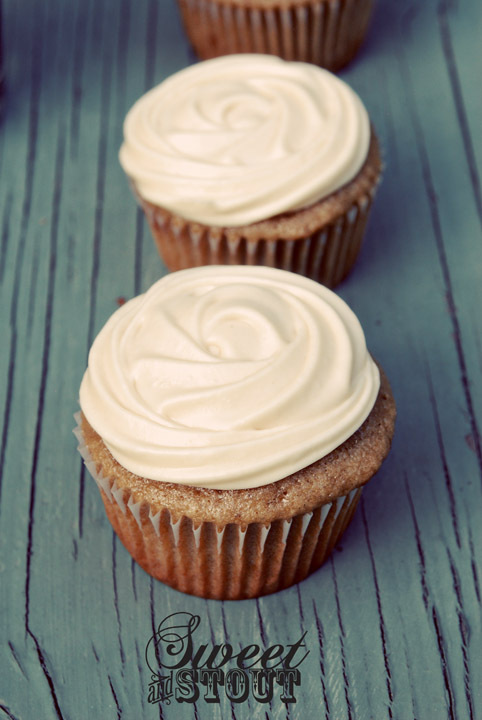 Ginger actually inspired our idea for this week’s cupcake flavor, but I’ll get to that. To top it all off, we got to meet Dan, of Duo Brewing, who happened to be in Spokane this Sunday. We’ve been following Duo Brewing for a while now, so it was really awesome to meet half of the duo behind the beer. We are definitely looking forward to trying some of their beers in the near future. That’s a chocolate covered potato chip on top of a chocolate cake, with chocolate frosting, of course! While I was talking to Ginger on Friday evening, she mentioned that she used to have a business that made chocolate covered potato chips. This sounded like such a tasty idea, I decided that we had to give it a try. Making them was quite easy, just melt some chocolate and dip in your favorite chip. Let me tell you, I’m really upset I haven’t tried this sooner in life. I’m sure they have no health benefits, whatsoever, but, they were the perfect balance of salty and sweet. Definitely worth trying. The only thing that bothered me about this cupcake creation was that the part of the chip that was covered in chocolate got a little soft, not necessarily soggy, just not as crispy as I wanted it to be. I’m not sure what would be the fix for it, but I’m willing to eat plenty more until I figure it out. 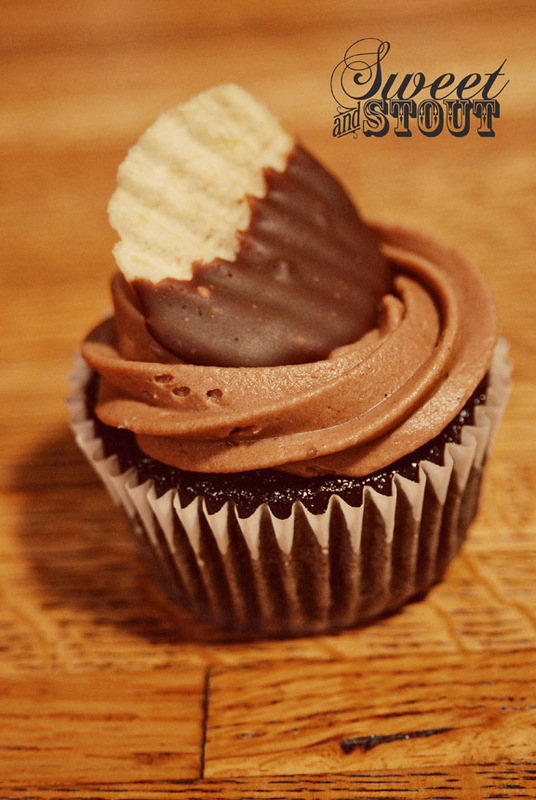 So, let us know what you think– would you try a chocolate covered potato chip (on a cupcake)? Because we love you all from the bottom of our beer bottles, we’re sharing a recipe this time! We’re also posting the recipe because the last time we used a Dogfish Head beer and didn’t post a recipe, there was hell to pay. We’ve learned our lesson. 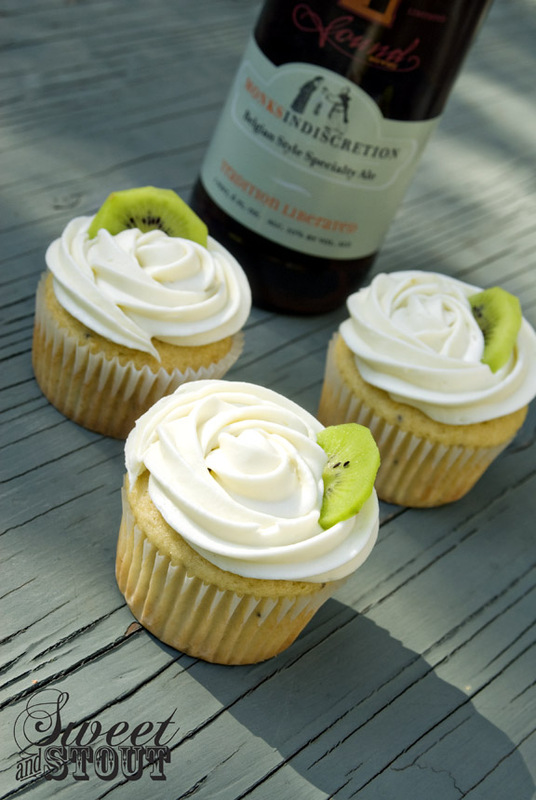 Now, I introduce to you, Rosemary Lemonade Cupcakes using Dogfish Head’s Saison du Buff, which is a collaboration beer between Dogfish Head, Stone, and Victory. This collaboration happened first in 2010, and now, again, in 2012. If you haven’t got your hands on this beer yet, I highly recommend that you do. 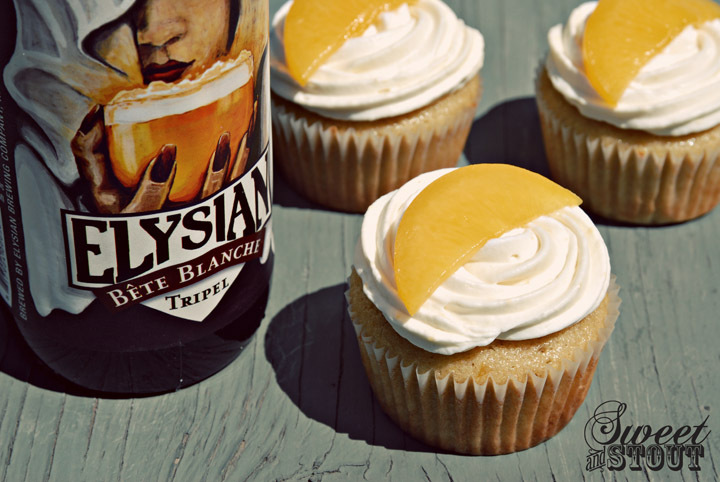 This beer is delicious, and is a perfect match for these rosemary infused lemon cupcakes. 1. In a small sauce pan, bring 1 cup water to a boil. Once boiling, add 1/4 cup rosemary leaves (we used dried rosemary). Boil for 5 minutes, stirring constantly. Remove from heat and add 1/2 cup lemon juice. Let sit while you prepare the cupcake batter. 2. Preheat oven to 375 degrees F. Place paper cupcake liners in pans, set aside. 3. Combine flour, baking powder, baking soda, and salt. Set aside. 4. In a large bowl, beat butter and lemon zest until creamy. Add in sugar, then beat again until combined. Add eggs 1 at a time, beating between each addition. 5. Beat in 1/4 of the dry ingredients, then add beer to the batter. Mix well. 6. Using a strainer to separate the rosemary leave from the juice, strain 1/2 cup of the rosemary lemon water into a measuring cup. (Save the remaining rosemary lemon juice to use in the frosting, see recipe below) Mix this alternating with the rest of the dry ingredients into the batter, beginning and ending with the dry ingredients. 7. Fill cupcake liners with a 1/4 cup of batter, place in preheated oven and bake for about 15 minutes. Use a toothpick inserted in the center to tell if it’s done after 15 minutes. It should come out clean. 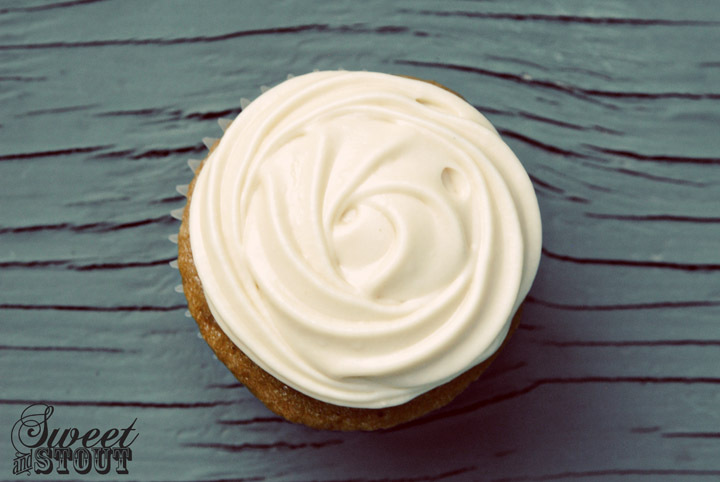 After your cupcakes have cooled, you can prepare the frosting. 2. Beat in powdered sugar, 1 cup at a time. Add in leftover rosemary lemon juice and beat well. If the frosting is too runny, just beat in more powdered sugar. 3. Frost cupcakes after they’ve cooled, and enjoy! If you make these cupcakes, please tell us how they turned out for you in the comments, we’d love to hear about them! 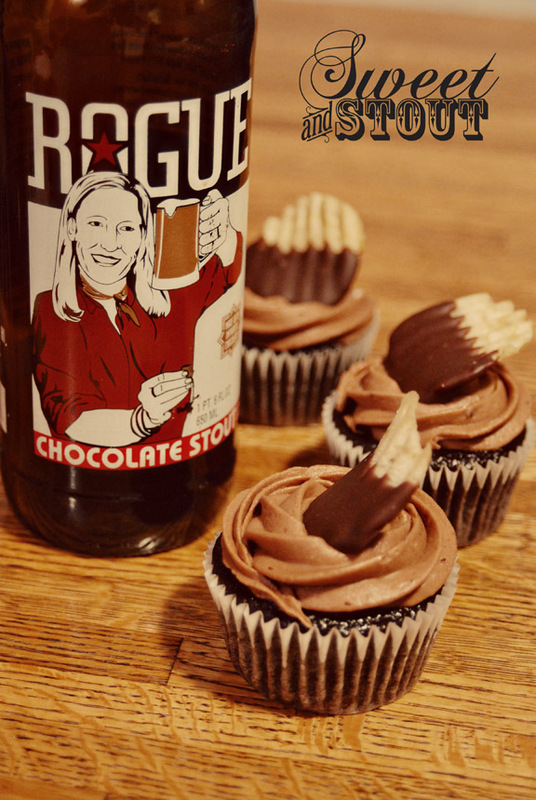 If you have an idea for a cupcake, or a beer to use, let us know! We’re always willing to try something new. This week’s challenge, aside from Dylan and I participating in Bloomsday (a 7.46 mile walk/run), was to create a cupcake based on a random fruit we picked at the grocery store. We’re always trying to do something a little different here at Sweet and Stout (in case you haven’t noticed!). When we arrived at the store, we discovered that kiwi was on sale, so that’s what we decided to use. For the beer, we picked Monk’s Indescretion (great name! ), a Belgian Style Specialty Ale from Sound Brewing. On the label the beer says that it’s “an intense tropical hoppy aroma & flavor, with balanced bitterness”, seemed a good fit, so we got it. This beer was VERY good, and, like the label also says, “scarily drinkable” with an ABV at 10%. Wowza. I’ve never baked kiwi into anything, so we just improvised the whole thing. The first thing we did was chop up the kiwi and boiled it with some water to make them nice and soft. Then we reduced it down a bit, while mashing them (with a potato masher), and finally added a little sugar to make a mushy, mashy, kiwi sauce. It definitely wasn’t the most attractive color, however it tasted delicious. We strained out some of the juice and set it aside for the frosting, then used the mashed up fruit in the cake. 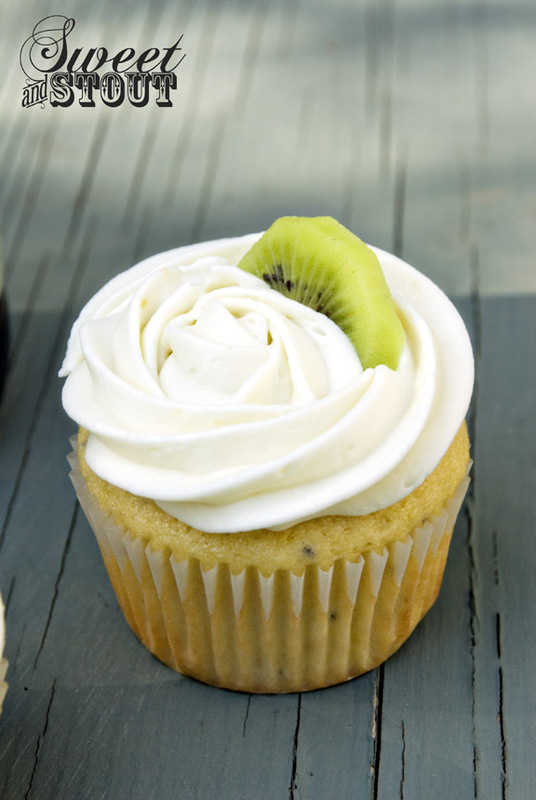 I used a recipe that I have for a lemon cake and replaced the lemons with kiwi, a simple swap. When the cake came out of the oven, it really looked like a lemon poppy seed cake. For the frosting I went with a cream cheese one (shocking, I know), and added the kiwi juice I had saved from earlier. I topped each off with half a slice of freshly cut kiwi, took a bite, and was very pleased with the outcome. Makes me wonder what other types of fruit we can base a cupcake off of. Anyone else have some ideas? P.S.- We’re so glad that we decided to wear our Sweet and Stout t-shirts to the Bloomsday race. Many people came running up behind us to find out “Where Beer and Cupcake Unite”, and they all seemed pretty excited that there are beer cupcakes here in Spokane. So, thanks to all the people that said “hi” to us, and we hope you’ll get a chance to try some of our cupcakes soon! Rub lime wedge around the edge of Weizen Glass. Put some salt in your hand and rub the edges of the glass through it to lightly coat the edge. 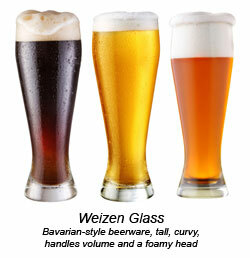 Put beer, limeade & tequila in a pitcher, then load each glass up with ice and pour beer mix on top. Top with a fresh lime wedge, then get drinking! 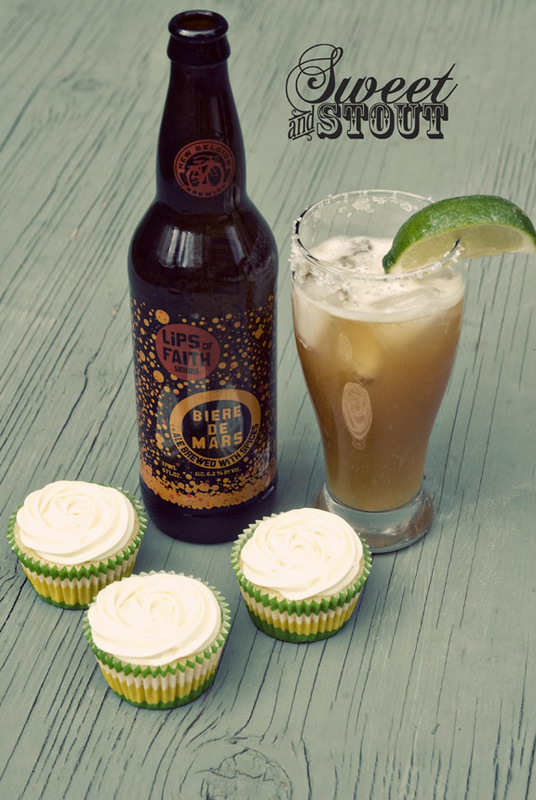 Now that you’ve got a decent drink in your hand, let me tell you about these BeerRita cupcakes we made. This is a yellow cake heavily flavored with lime. We’re talking lime zest and lime juice, oh, and we did throw a shot of tequila in there for good measure. For the beer we used Biere de Mars (see link above) from New Belgium Brewing. New Belgium seems to be taking over our refrigerator lately, and there’s a good reason for that, they make fantastic beer! Anyways, I just knew the Biere de Mars would be a perfect match. 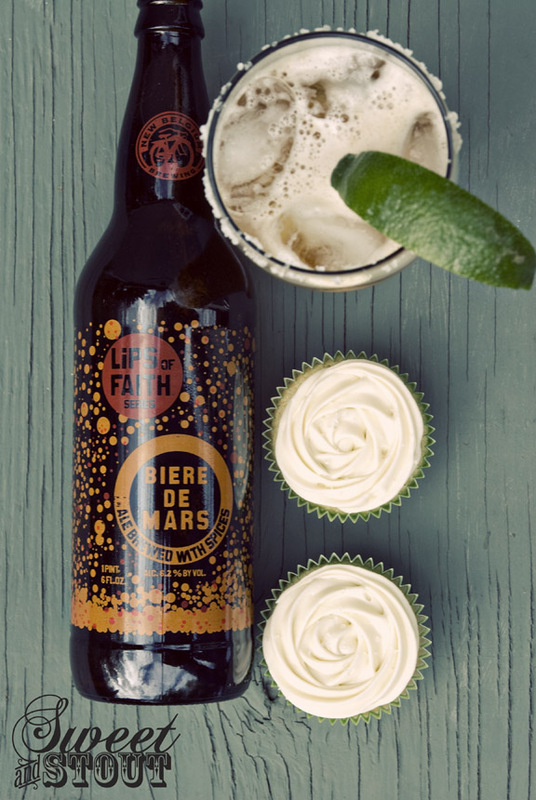 It’s an ale brewed with spices and has a citrus kick to it, perfect pairing for the sweet and tart of the lime flavor these cupcakes were bursting with. The frosting is a lime cream cheese one, we skipped on adding tequila to it (we totally could have, if we hadn’t run out of tequila, oops!). Then to garnish the cake, I put a pinch of sea salt on top to pull it all together. These cupcakes were delicious, and would be perfect for a summer day, or any day you feel like getting sloshed on tequila and beer. Drinking gives you the munchies, sometimes. Seeing as it’s just about May, these might be a good way to celebrate Cinco de Mayo as well! Maybe I’m wishing too hard for it to be summer, but this Sunday, it was pretty nice outside. 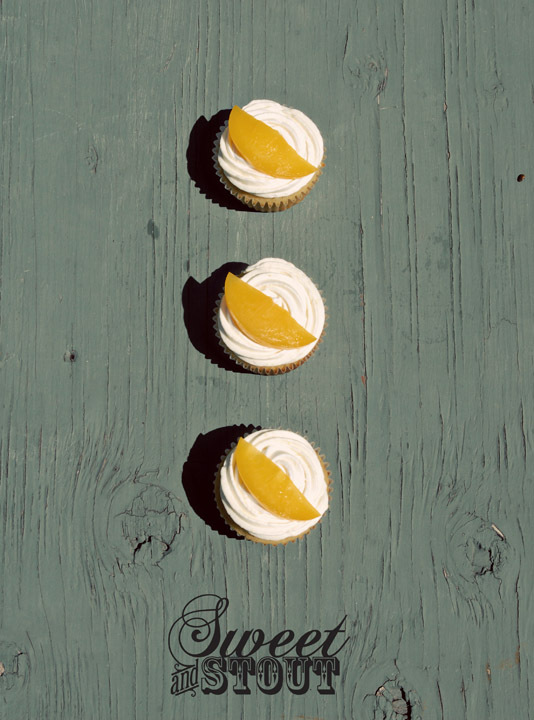 We wanted to make a fun cupcake to go with a warm summer (or near spring-like) day. 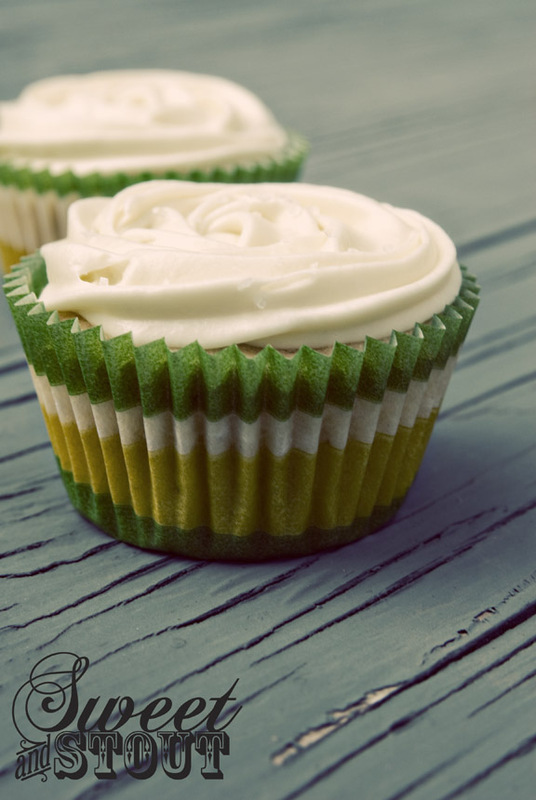 We both enjoy a tasty mojito, so why not flavor a cupcake after one? Plus, I found a recipe for a beer mojito, and could not resist giving it a try. Have you heard of beer cocktails? I don’t think it’s anything new, but I think it’s becoming more popular. Here’s a link I found to the beer mojito, and I know there are plenty of other good beer cocktail recipes out there. 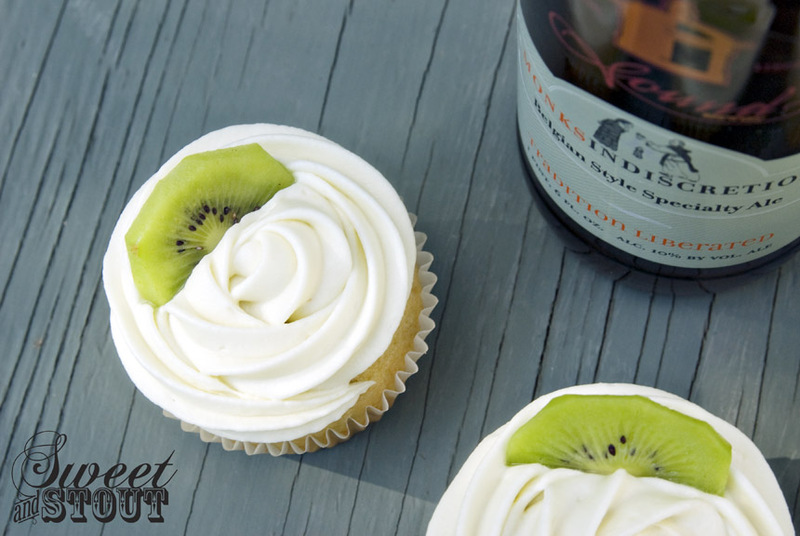 For these cupcakes I wanted to use a pale ale, something that would compliment the lime and mint flavor that mojitos are known for. 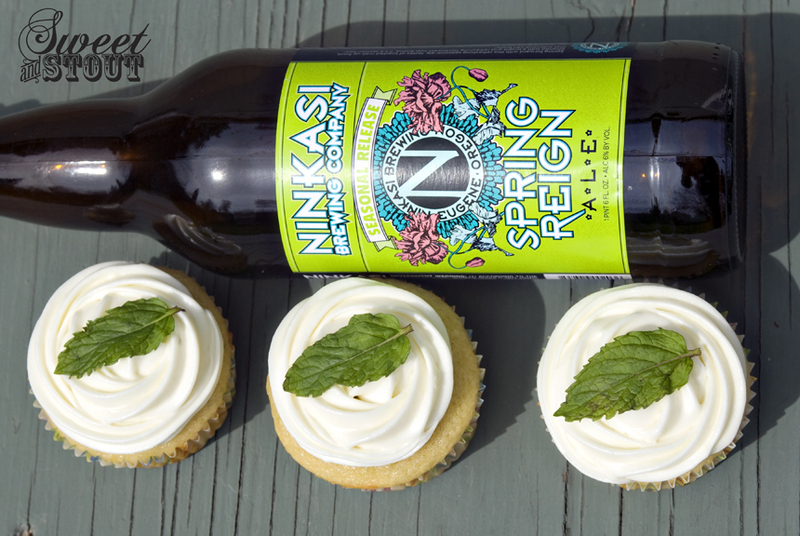 Dylan recently found the spring release of the Ninkasi four-pack, which included Spring Reign, a delicious pale ale. We decided that would be the best beer to use, plus I was saving the Tricerahops all for myself. (Seriously, if you like double IPAs, Tricerahops is the shizz.) 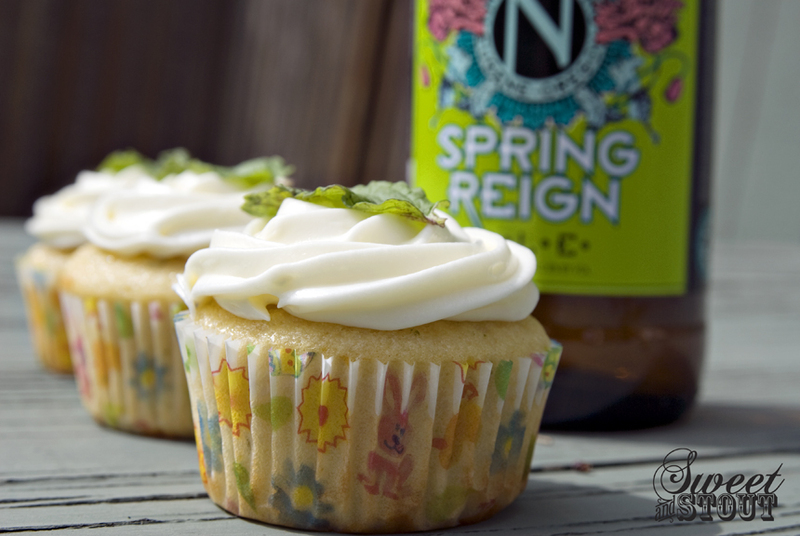 Anyways, the crisp taste and the light hop character of the Spring Reign was a perfect match for these cupcakes. To get the mint flavor, I steeped some mint leaves in the beer (heated up on the stove). After letting it cool, I added a little lime juice. Tasting the finished cupcakes, I’d go back and add a bit more mint leaves. You can definitely pull a lime flavor when you take a bite of these, the mint is a little subdued. Of course, this doesn’t mean it was a bad cupcake. In fact, they were quite delicious. 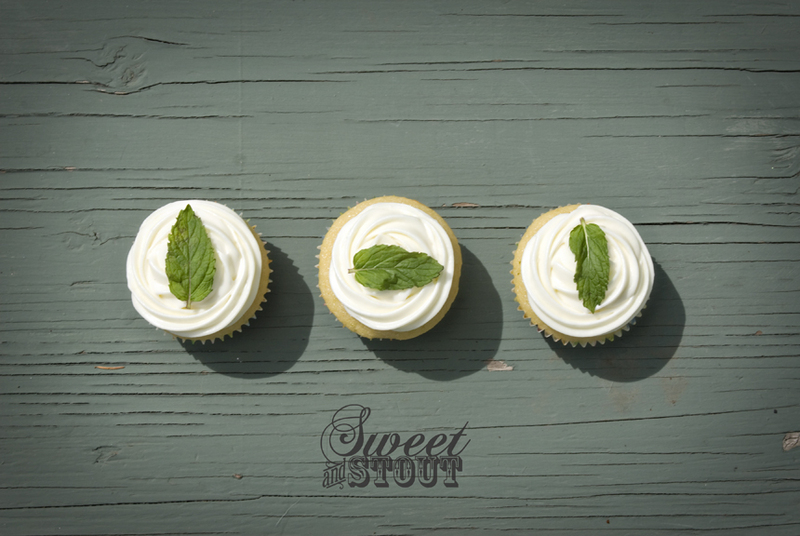 We used a cream cheese frosting flavored with more fresh squeezed lime juice, and garnished each with a mint leaf. I think lime would be a really good flavor for us to add on to our lineup for the summer. We did a lime cupcake with meringue last year, and these are much better. I don’t know about you, but I can hardly wait for summer to get here. 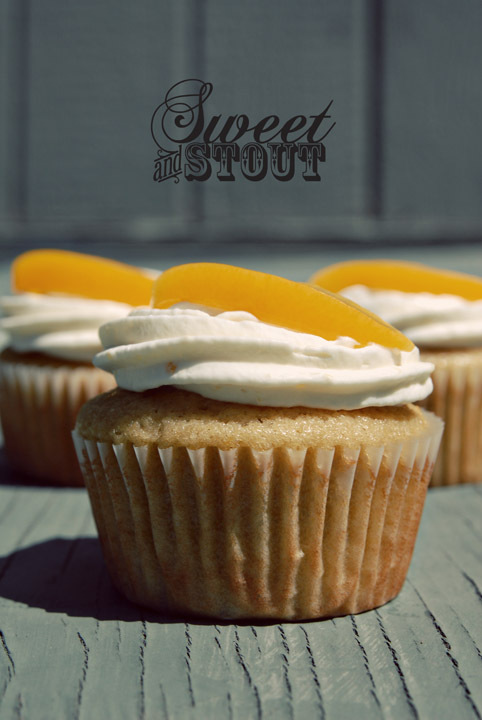 Patio beers, sunshine, and cupcakes sound really good right now! is written and photographed by Dylan & Jackie. Dylan & Jackie on KXLY's Good Morning Northwest.